The Ruby Angel Necklace with her vibrant crystals helps to replenish energy, passion and vitality. 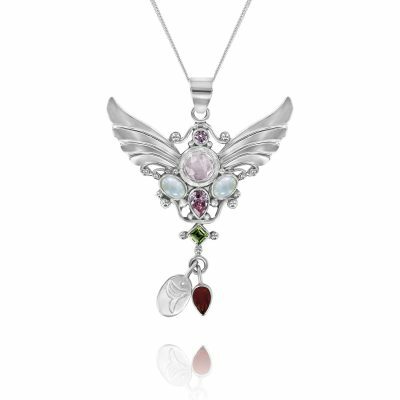 Wear the Ruby Angel for strength in adversity, to enthusiastically nurture the flame of love, and to bravely manifest your heart’s desire. 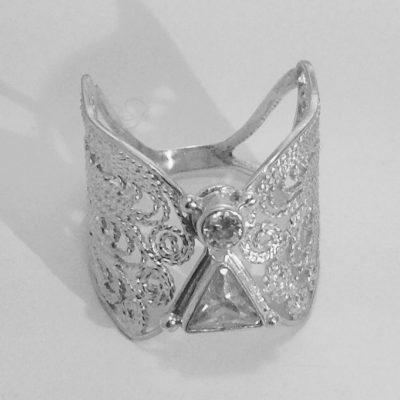 Length 2.5″ Birthstone for Mar/Apr/July. 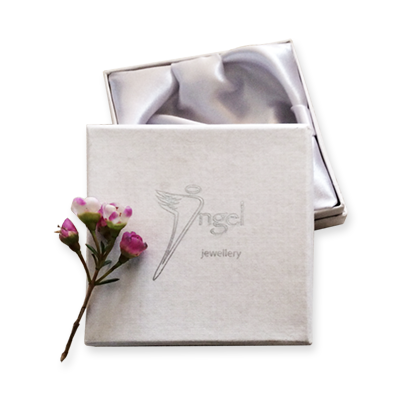 Comes beautifully boxed, with sterling silver chain & printout. 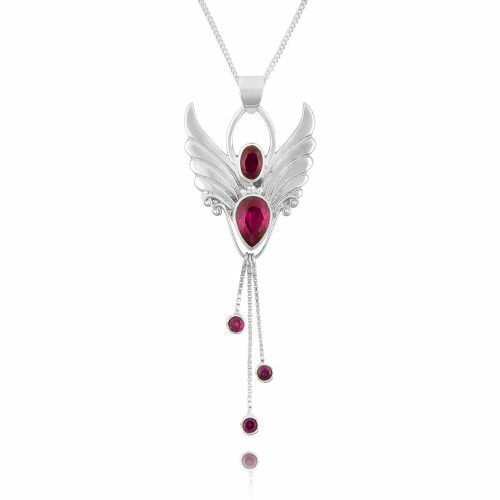 Our Ruby Angel Necklace is beautifully crafted in silver, and enhanced with gorgeous rubies glowing with inner fire. Use this Angel for manifesting your ideal life, and to re-awaken your warm hearted, generous heart to love relationships full of vitality and passion. This Angel’s purpose is to help mankind to better understand the law of attracting our desires by getting into the vortex, so we can create our life our way. You are a powerful creator and she will help you manifest all things to do with relationships and love if you ask her. Remember, Angels totally respect our freedom and would never act without our permission. 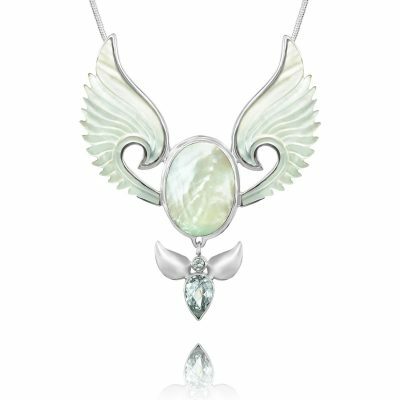 If you are dating, let the Ruby Angel Necklace with her sense of discernment be your trusted confident and guide as you navigate romantic partnerships with a view to manifesting your ideal partner. Ask or dedicate this Angel to help you develop intimacy on a deeper level, to heighten connection within your relationship and restore romance and passion. 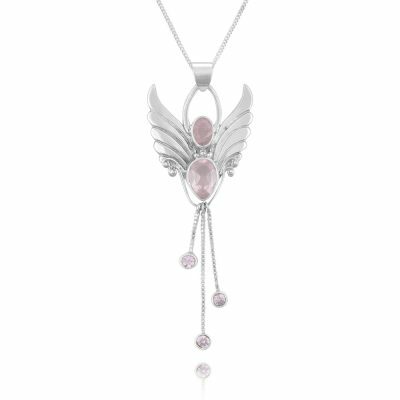 This Angel Pendant comes with an 18″ chain and has 2 cut crystals in the body and 3 dancing ruby drops which add a delightful movement to the piece, and also a touch of intrigue. 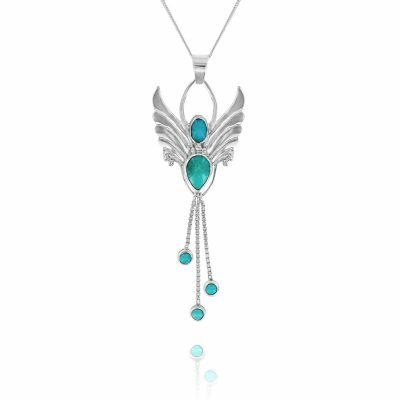 Angel Necklace with Turquoise for December.